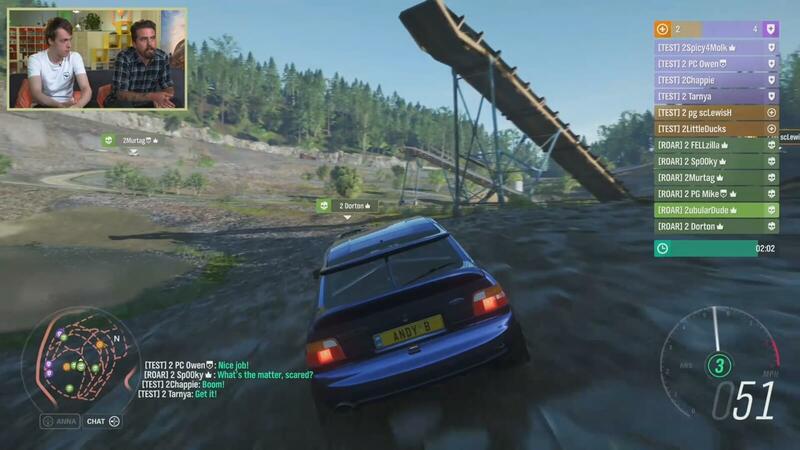 Playground Games hosted their fourth and final Forza Horizon 4 Seasons livestream earlier this week on Tuesday, July 31st. This one saw Spring cast its freshness over the world of beautiful, historic Britain in Forza Horizon 4 following last week’s Winter snowfall and blizzard-like conditions. That meant a fresh, crisp but wet environment with periodic rain-showers backed by beautiful sunshine. 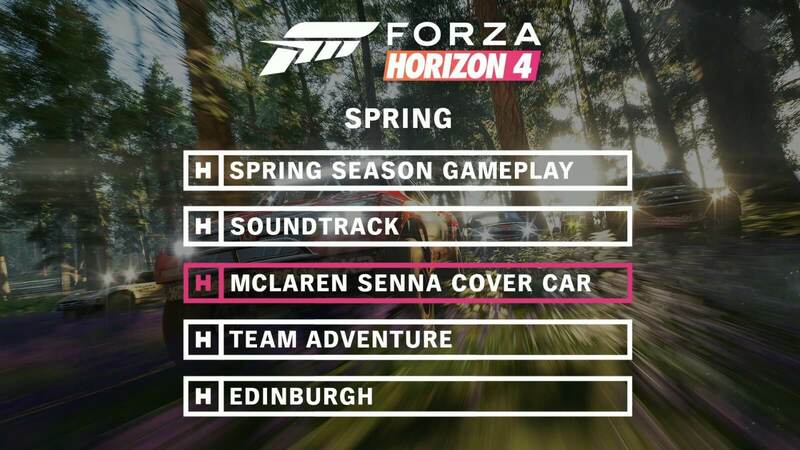 In addition to offering an outlook on Spring, we also had some details on the soundtrack in Forza Horizon 4, as well as the radio DJs that will be pumping out those tunes to please our eardrums during race events and when exploring open-world Britain. Playground Games also offered our first-look at the new competitive Team Adventure online mode, revealed details on how the development team captures audio for new supercars such as the McLaren Senna, and of course, they finally gave us a tour of Edinburgh City that has been eagerly-awaited by fans. As before, the livestream was hosted once again by Xbox On’s Benny Central. He was joined by Playground Games Creative Director Ralph Fulton and Art Director Ben Penrose. 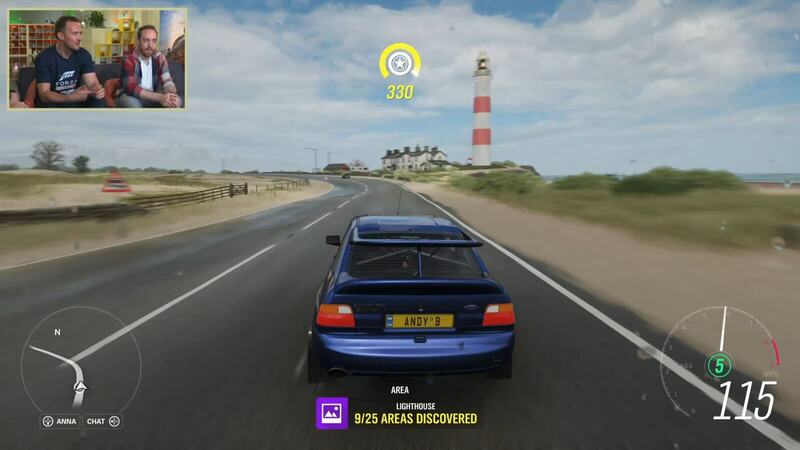 Forza Horizon 4’s Senior Audio Designer Fraser Strachan also joined the livestream to discuss the insight into how Playground Games captures its audio and sound effects, whilst finally, Game Designer Matt Piper and QA Manager CJ Penrice provided commentary throughout the Team Adventure segment. You can find the full video-on-demand of the livestream above. Otherwise, our full recap of everything we saw and learned during the one-hour broadcast can be found below. This week’s livestream began at the Lake Lodge home, located by the north-end of the Lake District, which Fulton pointed out to be towards the English and Scottish border in the game. Of course, the effects of Spring were already noticeable. The location felt very ambient with a lot more moisture in the atmosphere. It’s a very crisp visual experience with an overall fresh feel to the landscape. 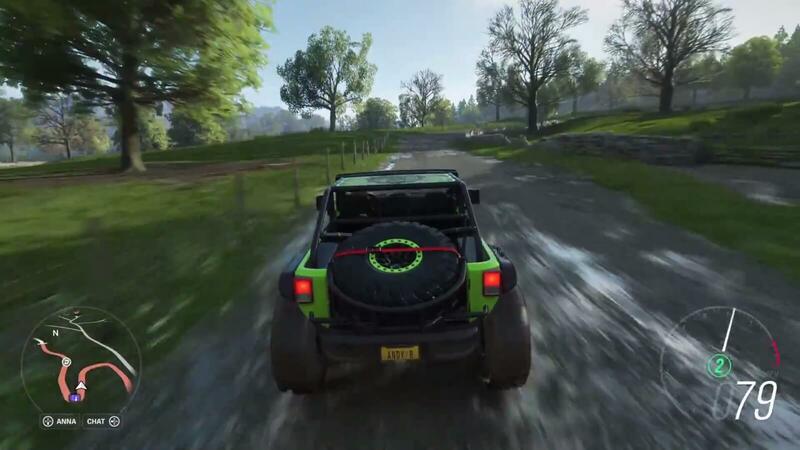 It’s also the wettest season in Forza Horizon 4, and this can be especially seen by the large puddles of water across various areas of the map, as well as the wet, deformable mud in the forests and adventure park. After all the deciduous trees lost their leaves in Winter, the trees in Spring have their leaves back once again – though some of them are still barren, which adds to the overall freshness to the world and makes it feel like it’s alive as plants and shrubbery grow but don’t mature until the Summer. There’s also pops of colour across the British landscape as well, with wild flowers blossoming across the woodland, accompanied by tall lush grass and yellow buttercups. Playground Games walked viewers through Spring in the 2016 Jeep Trailcat, which is the perfect vehicle for tackling a wet, muddy forest full of trees, plants and shrubbery. The thick tires of the Trailcat allows it to plough through the wet, deformable mud easily. In fact, it’s much easier to drive through a dense British forest than the rainforest and woodland areas of Australia in Forza Horizon 3. One of the reasons comes down to the improvements made to tree language. The difference between solid tree trunks and ones you can plough right through are easy to spot and it’s based on their overall thickness. Playground Games has ensured the distinction between breakable and hard trees is very clear, even in a vast forest environment. Forza Horizon 4 is more readable overall in terms of both navigating off-road and spotting the difference between solid and breakable trees. In Forza Horizon 3, people would usually stick to the roads, especially in the rainforest area due to regularly hitting into tree trunks. Playground Games are hoping the improvements made to tree language and off-roading in Forza Horizon 4 will encourage players to ditch the asphalt more often, and of course, there’s plenty to reason to do this. Be it the deformable mud trails in Spring, the overall sense of freshness and crispness in the woodland areas to the different kinds of animals roaming across the fields and forestry or even just the beach with its sand dunes. There’s a lot of different motives in Forza Horizon 4 to head off-road and explore the natural landscapes of beautiful, historic Britain. Spring colours were popping throughout the livestream, and one of the season’s unique aspects mentioned by Ben Penrose relates to the greens of the open-world. All the Spring greens are specific greens, and the team used colour-scanners to record and capture those greens. This makes the overall world fresher than ever, before it becomes more mature and lush in Summer. Additionally, the lighting work deployed in Spring is also noticeable, especially in the forests and woodlands. There’s more brightness to the world, and the lighting effects it leads to are simply excellent. It’s not just the colours or visuals that change, but the audio is also different in Spring as well. Roosters will greet drivers early in the mornings, especially by barns, whilst lambs will be found across fields before they mature into sheep leading into Summer. The birds and their songs will also be tailored and made unique for the season. There’s a lot of unique little details added to the world that make this specific season its own, and these will be spotted and heard by players as they traverse the landscapes of beautiful, historic Britain in this fresh, crisp and varied season. 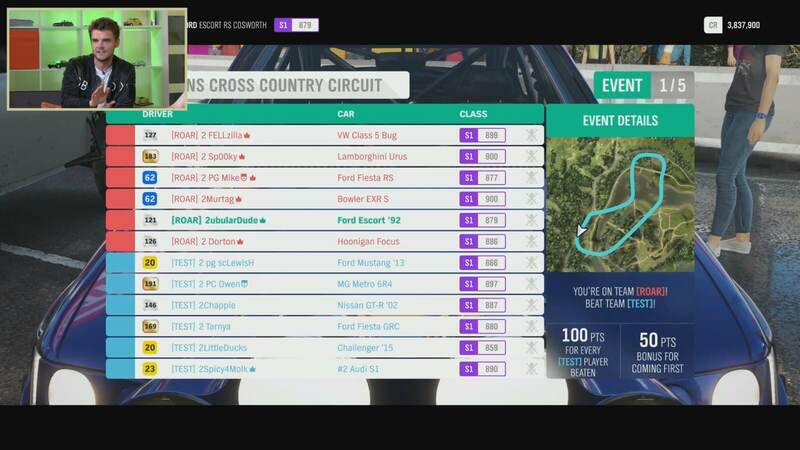 Ralph Fulton mentioned that in these livestreams, the team at Playground Games have been showcasing what the first four weeks of Forza Horizon 4 will be like for everyone. Players will be taken through each season as they are in the real-world, but the changes won’t stop there. Forza Horizon 4 will continue to change after launch as the team continues to support it with new content, features, fixes and so forth. Seasons will also evolve and adjust overtime as well, and with a weekly cadence of seasons, the team can deliver new content and features that it has planned, as well as other stuff based on community feedback. Ralph Fulton says this is something that won’t just happen over the months following the game’s launch, but also the years that come after its release. Essentially, Forza Horizon 4 will be Playground’s most heavily-supported game yet with content, updates and features to come in the weeks, months and years following its release – all delivered on weekly cadence to keep the game feeling fresh, alive and fun with an ever-expanding number of things to do. One example is how cars are delivered post-launch. Instead of the Car Pass offering access to monthly Car Packs over the course of six months, it now features two new cars every week for 21 weeks. Music is an incredibly important aspect of the Forza Horizon series. It sets the overall tone and atmosphere for both the driving experience and the festival. 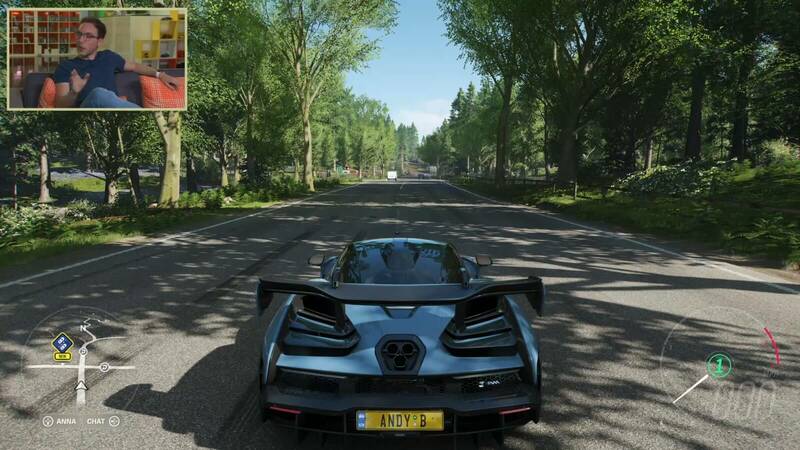 Whilst the reveal of the different songs and artists featured in Forza Horizon 4 is still some time away due to licensing arrangements, Ralph Fulton did tease the line-up of radio stations and their DJs included in Forza Horizon 4. 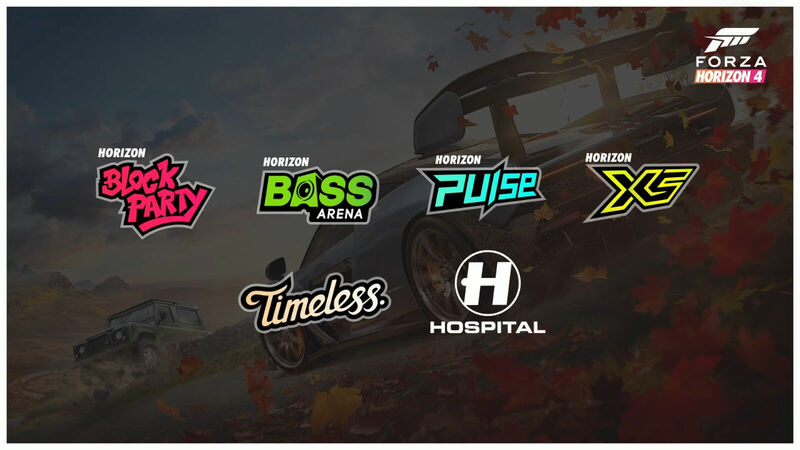 Horizon Pulse and Bass Arena have always been in the Forza Horizon series. These two fan-favourite stations will see their respective DJs Amy Simpson and Scott Tyler back in the hosting seat. They’ll offer the same bass, dance and chilled pop music as before. Meanwhile, Horizon Block Party will have hit-party pop songs, featuring a new DJ from the UK – MistaJam from BBC Radio 1 and Radio 1Xtra. 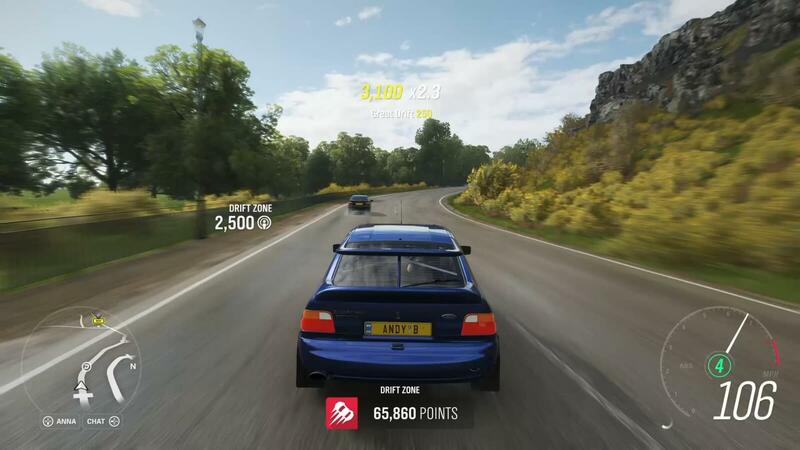 Timeless FM is also back in Forza Horizon 4, and it’s once again hosted by Australian DJ Dan Thompson as in Forza Horizon 3. There’s also a new station in the form of Horizon XS. This station is dedicated to rock music with big riffs, and it features a different DJ entirely with Malc. Finally, Hospital Records are also back and more involved with the game than ever before. In Forza Horizon 4, the station features completely new music from that label, with songs you won’t have ever heard. The E3 demo for the game exclusively features Fred V & Grafix, who were at Playground Games to curate the music used throughout the demo’s races. Fulton also revealed that this will be the opening 10 minutes of Forza Horizon 4 as well, introducing players to the four different British seasons found in the game. Expect to learn the full soundtrack of Forza Horizon 4 closer to launch. We also know Skill Songs will be back in this year’s game, but how they’re earned and unlocked will be a little bit different to how it was done in Forza Horizon 3. In that game, Skill Songs would be randomly played by the DJ on certain radio stations, and providing you were listening to the relevant one, you would earn a double Skill Score bonus multiplier for the duration of that song. 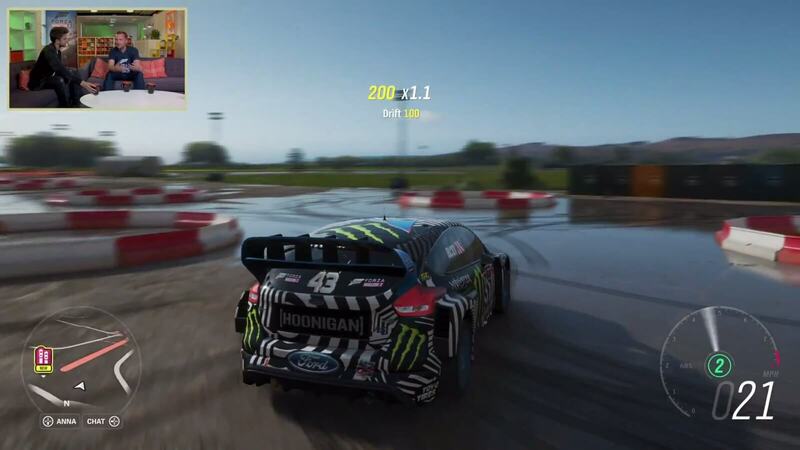 It’s worth noting that during the soundtrack discussion for Forza Horizon 4, the team showcased a Gymkhana-style stunt park by the aerodrome in Ken Block’s Ford Focus RS RX. A fitting combo to say the least. This stunt park is located at an abandoned airfield, and it’s where you’ll be able to perform epic skills and tricks with different Gymkhana-style stunts and jumps laid out across one of the runways. Don’t worry drag racing fans, as Playground Games hasn’t forgotten about you either – opting to include a second runway without anything to block the tarmac. 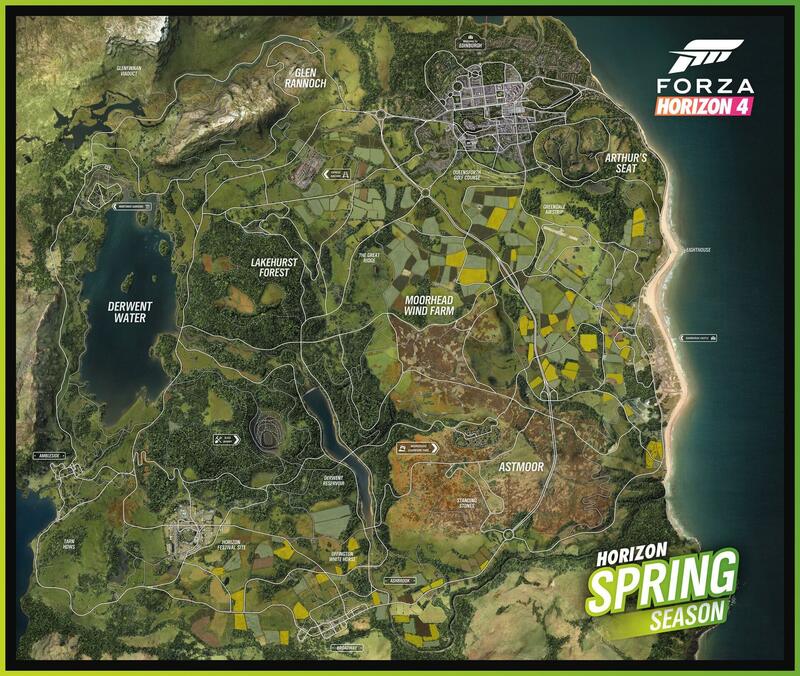 It’s also worth reiterating that Forza Horizon 4 does include multiple drag strips, located by the Horizon Festival with another at a beach towards the east of the map. 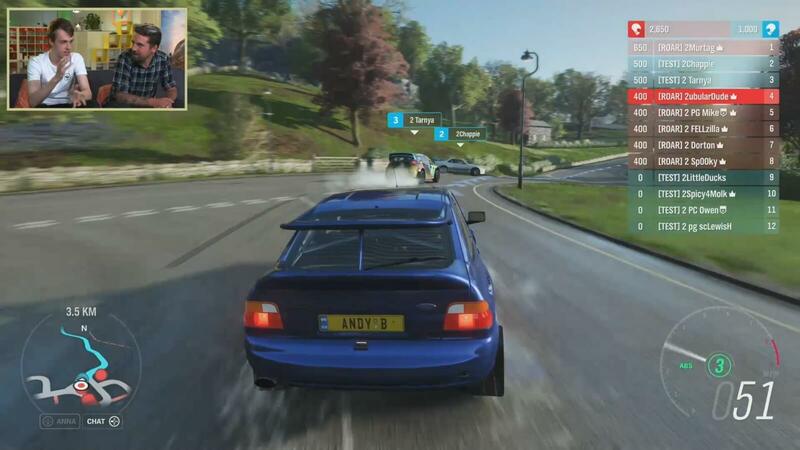 As mentioned above, Playground’s Senior Audio Designer Fraser Strachan also joined the livestream to discuss how the team collects car audio data for Forza Horizon 4. 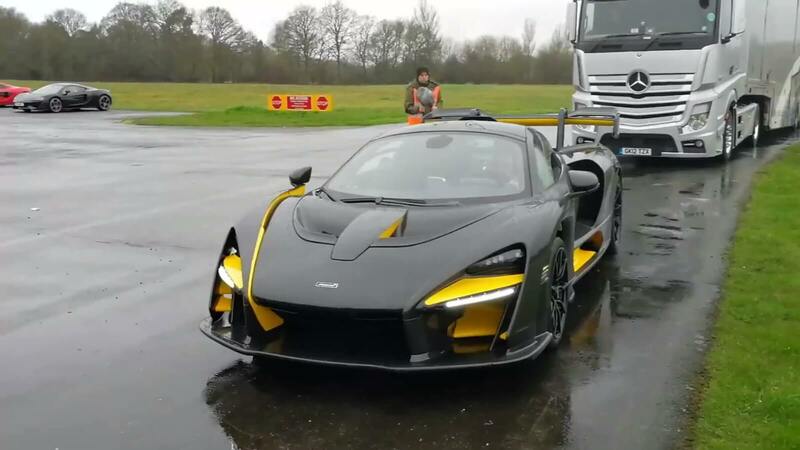 The McLaren Senna, 720S and 540C with their V8 twin-turbo engines were all sourced, captured and recorded at the Top Gear Test Track in Dunsfold, England with loaner models provided by McLaren. Playground’s audio engineers use authentic sourcing info to develop engine sounds used by vehicles in the Forza Horizon series, and this results in smooth whistles on cars like the Senna. The team also captured the audio of a V12 Ferrari engine, a tractor engine, as well as some classic old cars, too. The livestream also featured accompanying behind-the-scenes video clips of the process in-action, so be sure to check those out. Team Adventure is the new 6v6 team-based competitive multiplayer mode in Forza Horizon 4, which Playground Games are calling “a natural evolution” of Online Adventure from Forza Horizon 3. It’s been restructured to be “a properly competitive game mode,” and this time of round, it’s purely about the racing and your position, not performing skills throughout events. 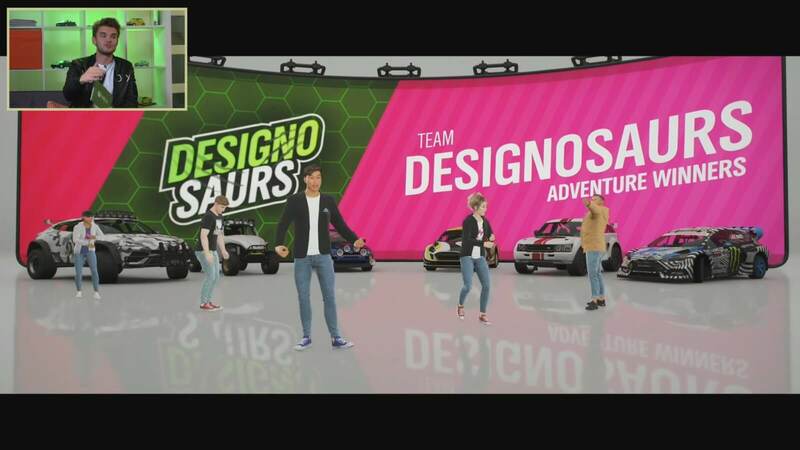 To demonstrate the mode to viewers, Playground Games hosted what it called “an epic grudge match” between the studio’s designers, referred to as ‘Designosaurs,’ and their QA testers, which were amusingly called ‘Simply The Test.’ The QA test team has been playing Forza Horizon 4 over the last two years throughout its development, but the designers are the people who create the game, bring the project together and make it work. They should know all the dirty tricks and the locations inside out, but either way, it was certainly a fierce battle between both teams. You can make and even name your team in the new competitive mode, and a logo will be generated for you based on your team name, which is a nice touch. Like the Online Adventure mode before it, every opposing team member you finish ahead of earns your team 100 points – with the driver in first place earning an additional bonus. The team with the most points wins, and Team Adventure is played as a best of five – so the first to three event victories, or three points, is the overall winner of that specific session. Think of it as an overall league event. The first race was a cross-country event, full of off-road trails and countryside driving, as well as massive pools of water everywhere. The environment was quite wet due to the Spring season. This was then followed by Freeroam Rush, a brand-new event that acts as an evolution of the ‘drive to the next race event’ objective that was in Forza Horizon 3’s Online Adventure and even Forza Horizon 2’s Online Road-trips, which is where the system originated from. Freeroam Rush counts as a race of its own, but with a twist – there’s no checkpoints. It’s up to you, the player, to figure out the best route. It’s like a race to the start line and it always takes place between the main events. Obviously, world knowledge if key for this as it’s all about figuring out the best route and taking the best shortcuts. Is it better to stay on the asphalt or head off-road? These are the types of questions and choices you’ll need to quickly decide on in Freeroam Rush. The better you know the map, the more of an advantage you’ll have in these events. Seasons will also change your approach here too, with the frozen lake in Winter, for example, offering a huge shortcut to take. Rewind also works in Freeroam Rush – and during normal online races too, for that matter. However, it only works for you and does so without pulling back anyone else in the game mode. This is a great addition for those who completely go off-course, miss a checkpoint, or slam head-on into a tree! Following the first Freeroam Rush session came two rounds of Survival – a new Playground Game mode featured in Forza Horizon 4. Think of this one as Team Infection, where there’s one team of zombies and another team of survivors. The zombies are marked as green on the map, the survivors are purple, and the zombies only have four minutes to infect all the survivors. The mini-map only highlights your teammates, which makes the search or wait that bit more intense and surprising. Survivors marked as orange on the mini-map have been infected by a zombie but can be healed if their allies crash into them. This adds another twist to the Survival mode and can change the overall dynamics and outcome of a round. There’s two rounds in one match of Survival, and the second one swaps teams as survivors instead start as zombies, and vice versa. To win, all your team must do is survive longer than it took the other team to hunt you down. Because Survival is played as a team-based mode rather than starting with one infected player, it doesn’t feel as intimidating. Instead, it results in the mode feeling more fun and intense right away. Players can also take advantage of the Quick Chat feature to easily communicate with their teammates or request help using the d-pad, which is a nice touch. It’s worth noting that the match of Survival played on the livestream took place at the quarry, but the beach towards the eastern side of the map can also be used as a Playground Arena for these fun-style game modes. At this stage of Team Adventure, the ‘Designosaurs’ had achieved two victories from the Cross-Country Race and Survival. The ‘Simply The Test’ team had won the first Freeroam Rush, which do count towards your victories, and following the match of Survival, it was time for another of these on the livestream. Luckily for the designers, it was a victory for them, and because Team Adventure is a best-of-five mode, it meant they had won the overall session. Forza Horizon 4 will feature three types of Team Adventure modes – all of which will be available at launch. One dedicated to racing, another dedicated to the fun mini-games, and both racing and mini-games fused into the one. There’s also ranked and unranked variants of all three different Team Adventure modes, with the ranked versions always offering 12-players in the lobby via skill-based matchmaking. These are delivered in the form of leagues and offer their own in-game rewards for participation. Car choice is also important in Team Adventure because you cannot change it during the match. Therefore, you need to consider the events, the different race routes, and formulate a strategy for the vehicle you do pick. 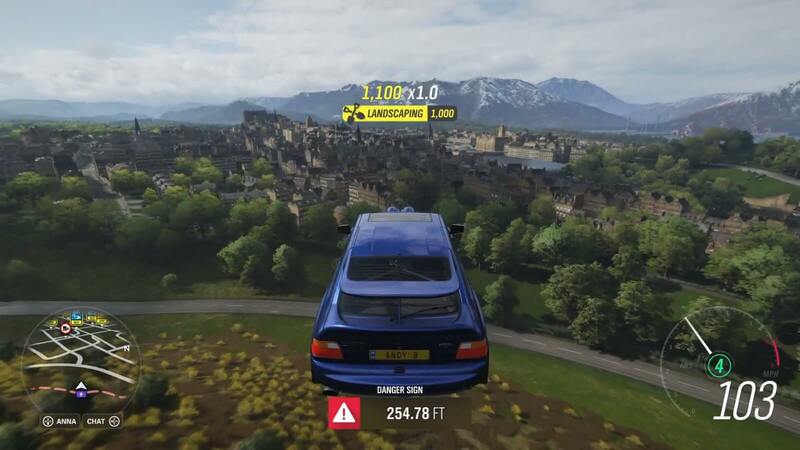 To end its series of Forza Horizon 4 Seasons livestreams on a high, Playground Games offered a tour of the beautiful city of Edinburgh. The Scottish capital is the main city environment in Forza Horizon 4, and Ralph Fulton believes that it’s the best city the team has ever built in the series. Fans were excited to finally see Edinburgh in the game and the drive on the way there offered us a glimpse at the east coast of the map, including a view of Bamburgh Castle and a big old British beach to go alongside it. There was a train-crossing on the way too, with actual barriers that pull down when a train is passing. This is also located at a Drift Zone, too. Before reaching the city, the drive to Edinburgh saw Playground take on a Danger Sign at Arthur’s Seat – the main peak of a beautiful collection of rocky hills located just outside of the Scottish capital. This offered a stunning view of Edinburgh, where you see the entire city as the backdrop. It looked incredible. Whilst the experience of driving in the city offers a different style of gameplay, the Forza Horizon series is predominately about the thrill of open-world adventure. However, the beautiful, historic architecture of Edinburgh combined with its wide-open city roads, unique monuments and large, spacious park areas make it a perfect fit for Forza Horizon 4’s unique take on Great Britain. For example, Edinburgh has a distinct road network in contrast to the grid-like road network of Surfers Paradise in Forza Horizon 3. There’s a lot of history in this location, and the level designers have been able to leverage the road network in Edinburgh to create unique race events. Combined with the old, historic architecture in Edinburgh, not to mention the various shops, monuments, small businesses, churches, parks and so forth, there’s a lot to discover within the city. It also feels unique and diversified, with green trees accompanied by pink, cherry ones scattered across the Scottish capital, offering a welcoming environment that feels homelier than the typical hustle and bustle of a non-stop city center. It’s a nice vibe overall. There’s also many famous buildings in Edinburgh too, not least of which is the castle. You can buy this as a property to own in Forza Horizon 4 but do keep in mind that it’s the most expensive one in the game. 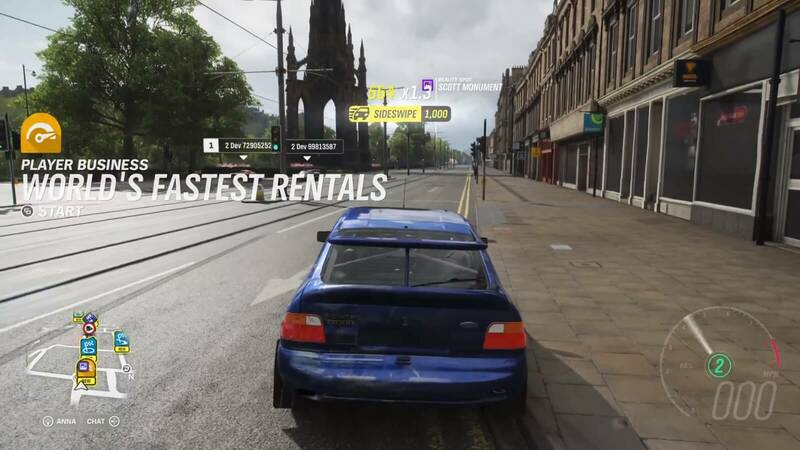 There’s also a business you can buy in the Scottish capital that’s related to the Horizon Stories campaign experience, and that’s ‘World’s Fastest Rentals.’ This is essentially a supercar rental business that allows you to drive supercars for fun as a job whilst renting them out to customers. This business will earn you in-game credits that are added to your account every time you log into Forza Horizon 4. Speaking of cars, we’re going to take a quick tangent here as the livestream also revealed that the Mercedes-Benz Tankpool Racing Truck from Forza Motorsport 7 will surprisingly be coming to Forza Horizon 4. It was on-stream for only a split-second, being driven by an AI racer around the open-world. Also highlighted was a Liberty Walk body-kit for the Lamborghini Huracán, which joins the widebody Lamborghini Murciélago already present in the Forza franchise. There’s also an off-road racing kit for the Lamborghini Urus, like the one revealed on the 2018 Jeep Grand Cherokee Trackhawk in the Autumn livestream. A total of 12 off-road kits will be made available in Forza Horizon 4, with more than 450 Forzavista cars to be featured in the game at launch. Overall, Edinburgh feels more spacious and diverse than the cities used in previous Forza Horizon games. It’s more vast and bigger, and because of this, it feels far less cramped and more alive than Forza Horizon 3’s Surfers Paradise and Forza Horizon 2’s Nice. It makes you want to visit Edinburgh. There’s also plenty of black Austin FX4 cabs driving around the Scottish capital as well, not to mention authentic little details such as the benches, bus stops and red post boxes, the dominant Scott Monument, as well as beloved areas like Princes Street – the main shopping thoroughfare in Edinburgh, and the Princes Street Gardens. 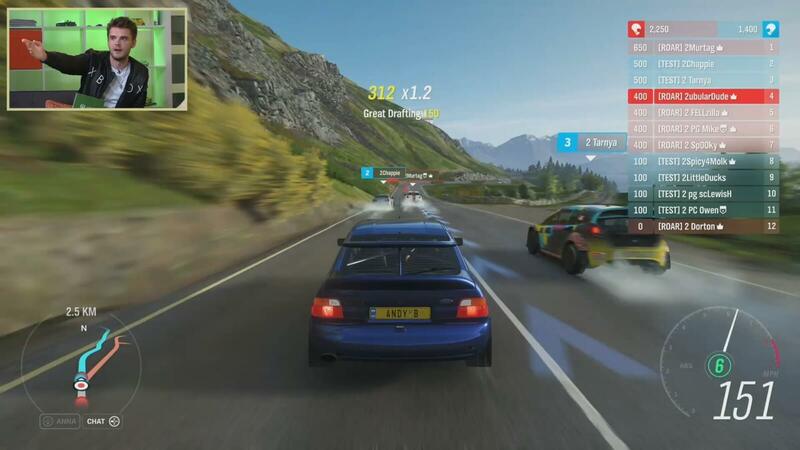 Playground Games’ Ralph Fulton also discussed on the livestream why the team opted to not include the English capital of London in Forza Horizon 4. He explained that London is “absolutely massive,” a unique city where every building is iconic, especially anywhere near capital’s city-center. The amount of work required to recreate London would’ve meant the team wouldn’t have had the time or resources leftover to build the rest of the game. London is so large and diverse that it would need to have an entire game devoted to it to do it justice. In doing so, you change what the game is about, and it becomes all-about street racing and cities – and suddenly you’re making Midnight Club. Fulton said that Rockstar’s classic racer is “a brilliant game, but not the game we want to make.” Instead, Playground Games focused on Edinburgh for Forza Horizon 4, a city that’s no less iconic nor beautiful, and it fits the game incredibly well. There’s also a total of 25 main areas to discover in Forza Horizon 4, all of which are based on real-world locations in Britain. The game tracks these for you as you play and discover them, which is another nice little touch. 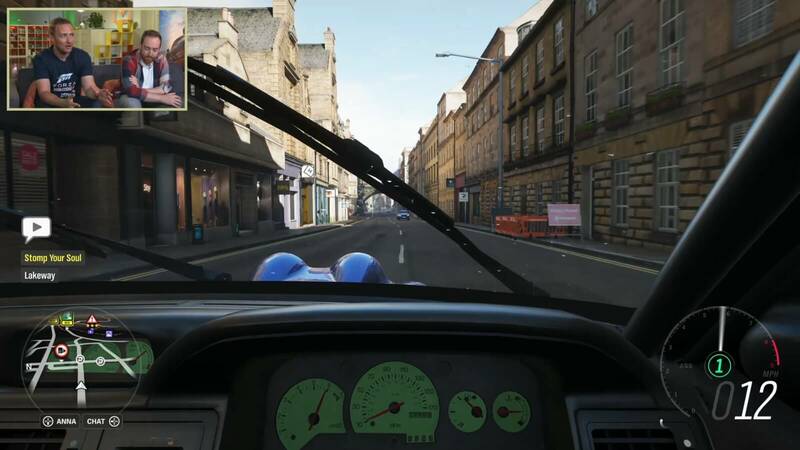 Following the guided tour of Edinburgh, which took place during daytime, Playground Games showcased one of the game’s Street Races. This thread of events takes place at night time, and they can be completed in solo play against Drivatars, in co-op with your friends, in Rivals mode where you set the best lap-time possible, or in PvP – so you can compete against other players in these events. For the case of Edinburgh, these Street Races look stunning. The Scottish capital is a visual treat for the eyes at night-time with its dazzling lights, popping colours and the updates Playground Games has implemented to the night-lighting model to bring the city to life in Forza Horizon 4. This specific Street Race event is called ‘Edinburgh New Town’ and it takes place by Calton Hill and the Royal Terrace before leading drivers towards the Royal Botanic Gardens on the outskirts of the city. Some of the visual uplifts noted by Art Director Ben Penrose include true shadow casting lights from cars and the environment, a feature the team has built for Xbox One X consoles. This is all rendering into the car bodies and they even reflect out of all the materials in better ways than before, so you’ll see all those pings coming off the metalwork. 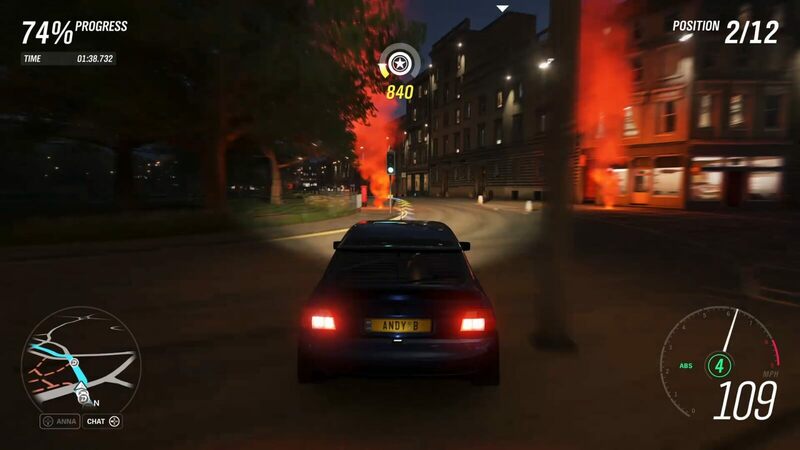 The flares used for checkpoints also demo the cool lighting features added to Forza Horizon 4, too – and they’re sure to look even more amazing when playing in HDR. Edinburgh is a visual showpiece at night-time, and it is all-around a beautiful city. The sky expresses a gorgeous purple hue effect after sunset, whilst the buildings have incredible lights from them. The shops are brightly lit-up whilst the street lamps make the city feel alive. The lights from the bus stations, houses and apartments also contribute to this. There’s even up-lighting from major monuments like the castles, which Penrose says were fun for the lighting artists to implement. With a visit to Edinburgh done and dusted, it was time for Playground Games to wrap up their fourth and final Forza Horizon 4 Seasons livestream. Spring offered us a whole new world in Forza Horizon 4, and its overall freshness and crispness once again highlighted how seasons really do change everything in beautiful, historic Britain. All four seasons in the game were as dynamic and as varied as you’d expect, offering a completely different perspective on the game’s open-world landscape. 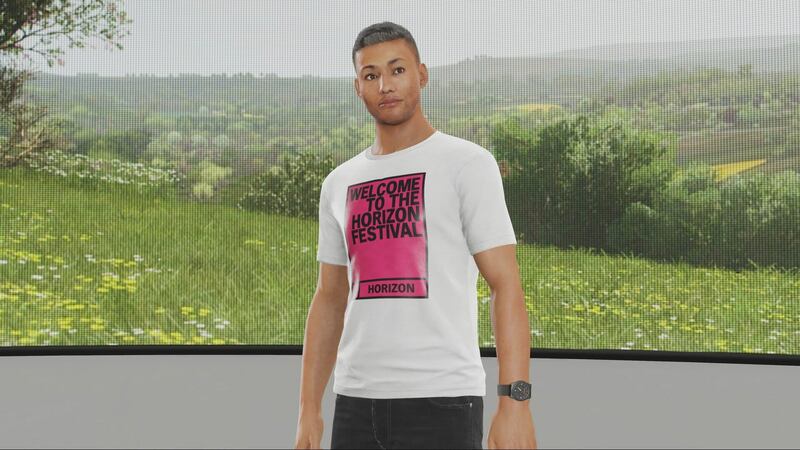 This exclusive Forza Horizon 4 driver t-shirt was also handed out to select lucky viewers on Mixer. Overall, these livestreams were something new for the team at Playground Games, and they sure didn’t disappoint. Typically, fans would be left dry on Forza news between E3 and Gamescom, with the car reveals usually being the only thing to look forward to in the month of July. That certainly hasn’t been the case for Forza Horizon 4, but looking beyond, the next milestone for the team is Gamescom in Cologne, Germany. At the annual event, which takes place from Tuesday, August 21st to Sunday, August 26th, we can expect to hear and see even more of Forza Horizon 4. Following Gamescom will be the train towards launch, with Fulton teasing lots of things to come in the run up to the game’s worldwide release date on October 2nd, 2018. The livestream then concluded with a recap of all the previous Forza Horizon 4 Seasons broadcasts. If you missed any of these live-shows, then you can catch up with everything you need to know in our in-depth recaps for Summer, Autumn and Winter. Furthermore, you can check out our Forza Horizon 4 hands-on story for our first impressions of the upcoming open-world racing game based on the E3 2018 demo.